Proud Life Member of the G.S.D. Federation of S.A.
We select the most compatible bloodlines to ensure that our offspring are for the betterment of the breed. We are a small kennel and we concentrate on quality rather than quantity. We boast with 33 years' experience and, like us, our dogs are honest and sound of body and mind. Hence our motto: "to strive and never give up". They are devoted companions and protectors. 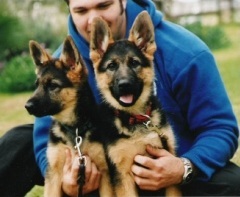 If you are interested in the showing and training of a decent German Shepherd dog, please contact us.